In the past few months, more garlic has been harvested in the northern hemisphere than in the previous season, so there are rising concerns for the future. Prices are under pressure and, according to growers in different countries, they have actually dropped to unbearable levels. There is a similar situation everywhere in the world. In Europe, growers are affected by the competition from cheap Chinese garlic. Spanish growers wonder whether the EU import duties in place to protect the domestic crops are effective. In South Africa, growers are asking themselves a similar question. The market was flooded with probably illegally imported garlic, so import taxes were circumvented. An investigation should shed some light into the situation. The garlic production has grown this year. Production has remained the same in some areas, but it has not decreased in any case. The harvest has now ended and everything is in cool storage. Traders can keep the product for longer nowadays, as the cooling techniques have improved. As a result, they can immediately build a stock for next year. The very low price of garlic this year has discouraged many people, so production will decrease next year. How much it will actually decrease is not yet clear, but it is certain that less will be grown/sown. However, the supply won't necessarily decrease much, since the stocks in cool storage can make up for the lower production. The garlic market itself is large in China. The price is very low, but it remains stable. A lot of garlic is exported to other countries, given their competitiveness in many markets. Yet they face competition from other countries where production is also on the rise. In fact, China has had a little more trouble to find foreign importers for their garlic this year because the supply is so great. There are also higher import requirements in Europe, so they have to take that into account. They consequently try to sell a little more on China's domestic market. Growers are closing a very difficult season. When the harvest was just starting in September, a large volume of imported garlic unexpectedly flooded the market. Prices therefore hit rock-bottom. The growers association and the South African Revenue Service have started an investigation into this presumably illegal import. There is no conclusion yet, but it is suspected that 107 tons of garlic entered without a customs clearance on the product's volume or value in order to circumvent import duties. There are substantial anti-dumping import duties on imports from different countries because of dumping in the past. The market needed about two months to absorb the surplus and the price is still extremely low. Legal imports from China and Spain are still arriving, mostly for their sale by retailers. South Africa is a net importer, but production in the country is also significant. About 44% of the total supply comes from domestic growers. The early harvest started in October after a difficult year for Australian garlic growers. Producers had to deal with dry weather, after which the harvest coincided with rainfall. At this time, there are not any reliable harvest figures available. The import of Chinese garlic has had an impact on the market over the past ten years, but the sector hopes that the health benefits of organic garlic and the introduction of new varieties will offer growers a good future. Garlic cultivation is small, but growing. At the moment, import garlic has the largest market share. 1,783 tonnes were harvested in 2016/2017, out of which 31% was delivered to the industry. Exports amounted to 94 tons and went mainly to Papua New Guinea. In terms of value, the production stood at 7.9 million dollars. Also, 12,792 tons were imported, out of which 8,761 tons came from China. Spain and Mexico also exported more than 1,000 tonnes to Australia. Importers in the US have just switched to imports from Argentina, which started in September. The South American country is an important supplier, but has a short season that ends in December. After the Argentinian season, Mexico takes over the market in April and May, just before the supply from the northern hemisphere dominates again. There is a good supply of garlic from the northern hemisphere. China, Spain and the US have had a good harvest. Due to the large volume from storage, the prices for the new harvest are under pressure. China has apparently tried to raise the price a number of times, but without success. There is also a lot of low quality product. As a result, the market as a whole is under pressure. The sector is going through a difficult time, as the production was again really big this year. As a result, the market conditions are tough and growers are uncertain about the future. The quality of the harvest is good, but the market cannot absorb the garlic fast enough. The sales of early Spring garlic have almost come to a standstill, while those of purple garlic are slow. The larger harvest in China is mentioned as a major cause. In the past two years, China has had a large harvest, after which prices have plummeted on the global market. That larger harvest in China is the result of the situation a few years ago, when bad weather took a heavy toll on the production and good prices were obtained. Growers then decided to expand, eventually resulting in a large volume on the world market. The European production is protected by a trade tariff of 1.20 Euro on imports, but according to the Spanish sector, this measure is not effective. "We think that good controls are not applied on the productions imported into the EU from third countries, where the cultivation costs are generally lower than in Europe (...). Imports from third countries such as China have a 1.20 Euro tax, which we believe should be the minimum price on the European market, but the average price stands far below this figure, so something is apparently not right." It has been a "problematic year" for Italian garlic growers because of the large harvest in all producing countries. As a result, the prices are low. On top of that, there were imports on the European market from countries that are normally less focused on Europe, such as Turkey and Egypt. At the moment, there is hardly any demand. "That's why we expect the market to collapse before the end of the year," says a trader. He is also not optimistic for the first weeks of 2019. The South American harvest is larger than last year. In Europe and China, the harvest was similar to that of last season, so the situation will likely stay the same until the summer of next year. Italians consume around 60,000 tons of garlic, but only half of them are grown in the country itself. Spain harvests about 260,000 tons, so it is in a stronger export position and has a firm foothold in the Italian market. Moreover, Spain has the advantage of having a more mechanized production, so labor costs are lower and growers have more resources at their disposal. In order to achieve a solid profit, the garlic must yield 1.50 Euro per kilo for the growers. At the moment, the price stands at 1 Euro and sometimes even lower prices are recorded. In any case, the imports from China and Spain are cheaper. A trader warns that prices have been so low for several years that growers may be tempted to abandon garlic in order to try another crop. A trader explains that the larger Chinese production puts prices directly under pressure worldwide. Also, more garlic is kept in storage. A trader sees the processing industry as an option to alleviate the situation on the market. An Italian company wants to start marketing dried garlic next year. The last stocks of French garlic are on the market in January. After that, traders switch to origins like Argentina, China and Spain. In total, the French consumed 40,000 tons of garlic this year, with 20,000 of them grown on French soil. The French production thus remained the same as last year, while in 2016 it still amounted to a modest 16,000 tons. It is no wonder that domestic production has increased. French people are so fond of French garlic that many supermarkets only offer other origins when France is completely out of the market, says a trader. French garlic is therefore almost not exported. Compared to last year, prices for domestic white garlic rose by 10% and prices for purple garlic by 15%. Organic garlic also does well in France. Due to heavy rainfall at the beginning of the spring, the volumes decreased by 50% and at this time growers are getting € 4 to € 5 per kilo. The price for import garlic is not as good. Both Spanish and Chinese garlic have seen their prices halved compared to last year. After a good harvest in Europe, the supply is quite large and this has resulted in low prices. 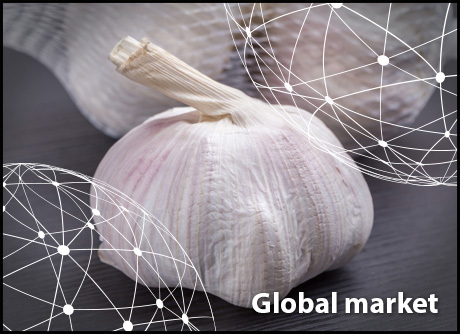 Due to its large volume, China determines the prices on the German market, even though a lot of Spanish garlic is also available. Spain, the Netherlands, France and Italy are major players in the Central European market. More and more consumers are opting for European productions. Regionalism is becoming more important for traders and consumers. The cultivation of garlic is also growing in Germany and those crops are becoming popular in the retail. The demand for locally grown products keeps European garlic competitive against Chinese imports. In spite of this, Chinese garlic remains important on the market. The demand is good in the run-up to Christmas, although the market for fresh garlic is good all year round. According to a German trader, consumers have a preference for European products, but he is satisfied with the Chinese garlic. "Chinese garlic has a good and uniform appearance. Many steps in the process can be done manually due to low labor costs, which results in good sorting and high quality." According to Dutch importers, the conditions in the garlic market are not too bad at the moment. The price of white Chinese garlic is attractive. Also, there is good demand within Europe and the importers expect that this will certainly continue until the Chinese New Year. Spain is having serious quality problems, so importers are focused on China. Depending on the packaging and the quality, trading prices oscillate between 13.50 and 14.75 Euro.